These luxury straighteners from Nicky Clarke have sat on my dresser whilst I've been testing them out over the past month, I would normally finish using straighteners and wrap them back up and put them back into my hair tool drawer as the black ugly things would just stand out in my pristine white room. 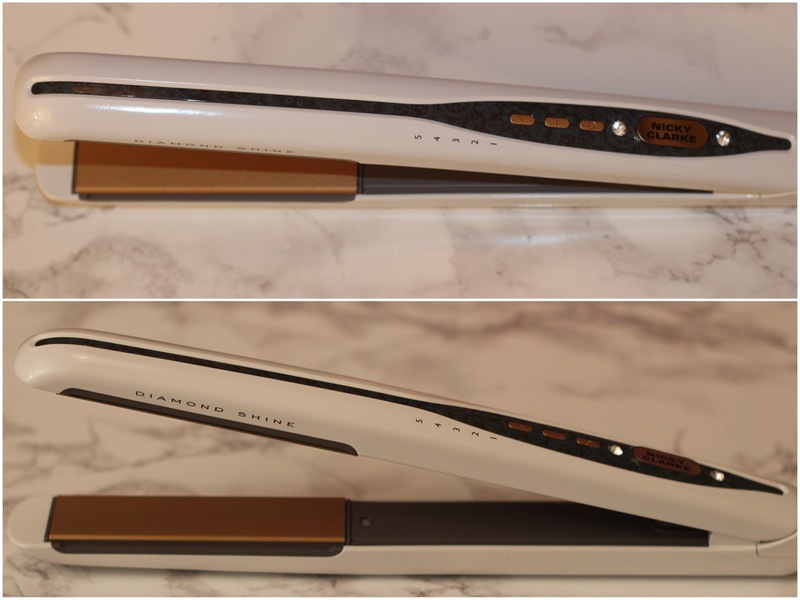 With these Nicky Clarke Diamond Shine Straighteners they sit proud as they're just so pretty, perfectly white so they stick out like a sore thumb and although I don't shop for straighteners regularly I've not seen many white ones on the market. Looks aside I really like these straighteners, they feel great in the hands when you're working through the hair, they don’t drag or pull and of course make your hair smooth and straight but the shine, oh the shine is fantastic. Being someone of alternate hair colour it can often look very dull and these straighteners make them shine like nothing else. A couple more features I have to point out are that they have a swivel cord, as someone who isn't the most co-ordinated this feature is a big deal as you don’t have to keep changing the angle of the straighteners when you're trying to create your style. The straighteners also heat up in 15 second and have an auto shut off after 60 minutes so you don't have to keep second guessing yourself if you switched them off or not when you leave the house as they'll do it for you. I think these are nice touches that do make a difference when you use hair tools on a daily basis. They are very pretty! And not a bad price for straighteners.